Another Successful Bowl for Kids’ Sake - Enova International, Inc.
Enova team members rolled out in record numbers for our third annual Big Brothers Big Sisters (BBBS) Bowl for Kids’ Sake event on Wednesday, May 12th at 10 Pin Bowling Lounge. 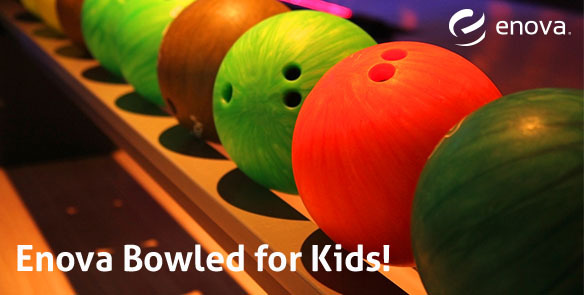 A total of 178 bowlers on 27 teams showed up to support BBBS of Metropolitan Chicago. That represents a 27 percent increase in bowlers from last year! The study also found that Littles were more confident in their performance in school and getting along better with their family members! Enova has been a proud supporter of BBBS of Metropolitan Chicago since 2010. In addition to Bowl for Kids’ Sake, 14 Enova team members serve as Bigs and meet with their Littles every other week, usually at Enova’s offices. Whether donating time, talents or funding, we feel good knowing that we’re helping children reach their full potential and build their futures.